Edmonton’s former poet laureate, E.D. 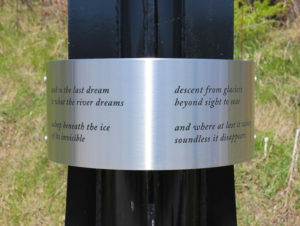 Blodgett, wrote 40 poems that can be found on acid-etched steel bands on 40 streetlamps lining the walking paths in Louise McKinney Riverfront Park. Blodgett carefully considered the landscape while writing the poems, stating they were “designed to highlight people’s enjoyment of the river valley by giving them something artistically transformative to think about as they take in the view.” Select poems were translated into Chinese, Cree, English, French, Michif, and Ukrainian reflecting Edmonton’s unique cultural ambience. Athabasca University Press published Blodgett’s book of 40 poems – Poems for a Small Park – in 2008. It is available for purchase or as a free PDF at aupress.ca. Biography: E.D. Blodgett, poet laureate of the City of Edmonton (2007-2009) and a two-time winner of the Governor-General’s Award, has published more than 20 books of poetry. Born in Philadelphia, Blodgett moved to Edmonton in the 1960s and taught at the U of A for 34 years, where he remains a Distinguished Professor Emeritus of Comparative Literature. He holds a BA in English from Amhurst College (1956), MA in French from University of Minnesota (1961), and PhD in Comparative Literature from Rutgers University (1969). Blodgett is a Fellow of the Royal Society of Canada and the recipient of the Henry Kreisel Award for Excellence in Teaching (1997) and the J. Gordin Kaplan Award for Excellence in Research (1998).